I am a firm believer that a cozy, delicious bowl of soup is the ultimate comfort food! This hearty soup is loaded with fresh veggies and is packed with flavor. I love the combination of spicy jalapeño with the sweet corn, but if you are not a fan of spicy food, you can omit it. It will still be delicious. I have kept it on the lighter side by using a cornstarch slurry to thicken instead of a traditional roux, which is a mix of butter and flour. A cornstarch slurry also happens to be a good way to keep it gluten-free if needed. Just make sure your other ingredients are also gluten-free. In a large pot cook bacon until it is crispy. Remove bacon and drain on paper towel. Reserve for garnishing. Saute onion, celery, and peppers in the bacon fat until softened. Add corn, potatoes, stock, milk, and seasonings. Bring to a simmer, cover and cook at a low temperature until vegetables are tender about 20 minutes. Add chicken to pot. Bring to a gentle boil and stir in cornstarch mixture. Cook, stirring constantly until soup is thickened. Remove bay leaf. Adjust seasonings to taste. Garnish each serving with reserved bacon, sour cream, and chopped green onions or chives. 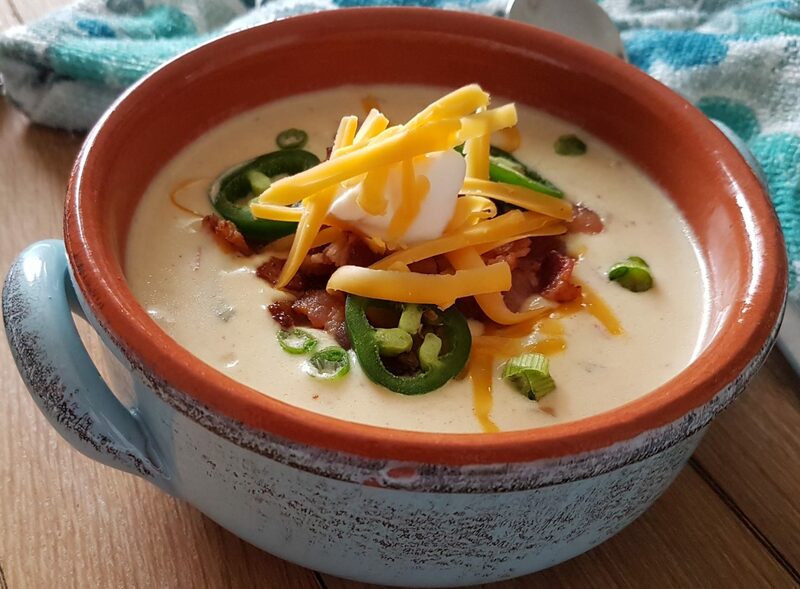 This entry was posted in Main Dish, One Pot Meals, Quick and Easy, Sides, Soups and Stews and tagged Bacon, Chicken, Corn, Jalapeno, Soup. Bookmark the permalink.